I had a lovely day in Milton Keynes today despite my preconceptions of the town! 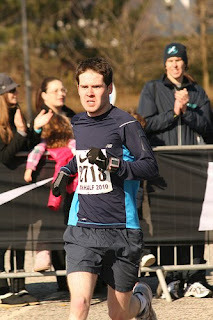 It was a beautiful day and although very cold, decent conditions for running. The sun was splitting the skies making running a more pleasant experience. I was quite apprehensive about this one being my first attempt at the distance. I knew I could finish it but I was concerned about pacing and knew I needed to treat it differently from a 10K. When I input my best 10K time into predicted race time calculator it came out with about an hour and 21 mins, but I thought this was a bit too ambitious for my first race, and after mainly training for the 10K distance. 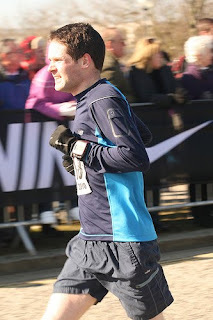 But I managed to sustain my pace over the distance and was absolutely delighted with a time just under an hour and 22 minutes. It really is a battle between mind and body for a lot of it. Always nice when people along the route cheer you on as well. Highlight of the race was the customary sprint finish which actually came in two parts! I was running with two other guys and just as I came to the turn to the finish I pressed the super boost button and sped passed them, bringing the crowd to life. But it wasn't over....one of them then started his sprint finish so I had to press the boost button again, we had a head-to-head battle over just a few metres. I won that battle fortunately. I believe both the photos (taken by the great fowk at 42run.com) are at the finish. 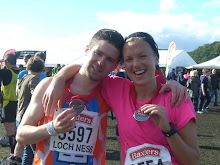 I dedicate this one to my running buddy Lynsey who also got her half marathon personal best in Edinburgh this morning! Look forward to seeing you on the 23rd of May for the big one Lynz!